Bonn Minister Church is an iconic Roman catholic church belonging to Pre-Renaissance period built between the 11th and the 13th centuries. The Minster once served as the cathedral of the Archbishopric of Cologne belonging to the Theban Legion. It is a 82 meter high minor basilica of Saints Cassius and Florentius. The Roman legionaries were beheaded at the church in the 2nd Century AD for their progressive religious beliefs. 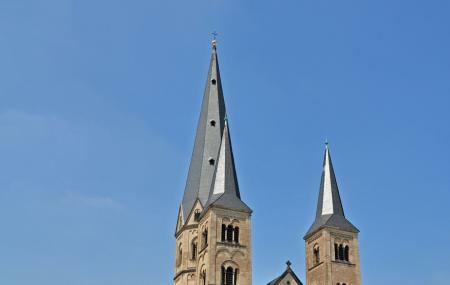 Completed in 1248, the Bonner Munster Church is unique in its Spire design highlighting the influence of Romanticism on Gothic architecture. Today, the place is a tranquil bastion for solace-seekers. The enticing architecture of five-towered church is heightened by the blue-red windows of the apse. The windows represent the influence of Rhine expressionist Heinrich Campendonkon on the city’s landscape. Guided tours are available organized exclusively by the Bonn Information or the Bonner Münster Foundation. Non-German tours are prepared by the "Bonn Information" organization. Do attend a 15-minute noon prayerat the Minster Church. How popular is Das Bonner Munster? People normally club together Beethoven-Haus Museum and Markt And Old Town Hall while planning their visit to Das Bonner Munster. Its look like good from outside,, but i guess these days u cant go inside because of renewable.. I try to go inside 2 time but i didnt found the door open!